SoftPlanet makes it possible for everyone to get free 3DP Net download directly from our servers. There is no registration needed for downloading. 3DP Net 14.07 is a great utility, which can handle your Ethernet issue. The app automatically detects missing Ethernet card drivers. If the device management software is the reason for your Internet challenges, 3DP Net will help you for sure. Since it is 100% free of charge, you can download and have it right away. 3DP Net 14.07 is designed to automatically detect installed or missing Ethernet card drivers. It checks whether there is a new version too. Thus your Ethernet device will be always up to date. Besides that it can also enables you to backup drivers and restore them to a previous condition. 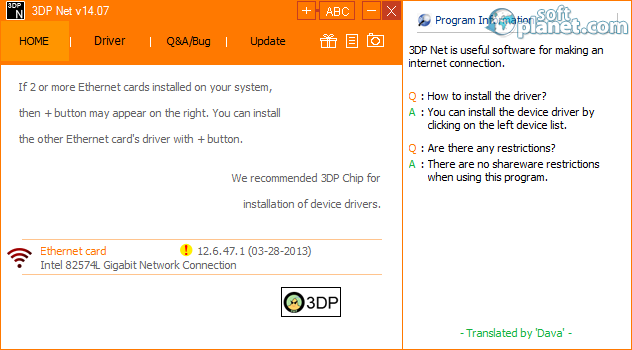 3DP Net comes with a minimalistic graphical interface. On top you will see its navigation menus. 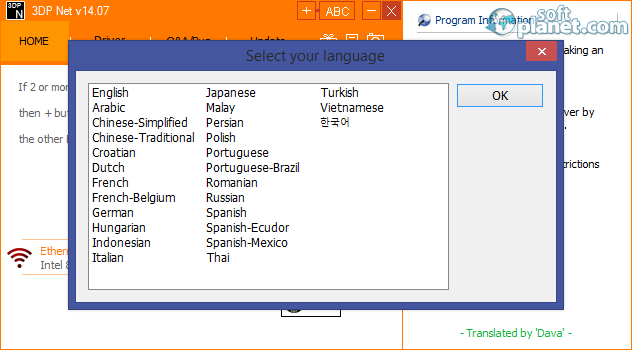 Once you run the app the Program Information panel will appear to the right. Its well-balanced white-orange color scheme makes it look very simple, yet classy. In addition, please keep in mind that 3DP Net is completely globalized in various languages such as English, Arabic, Chinese (Simplified and Traditional), Dutch, French, German, Italian, Japanese, Polish, Romanian, Spanish, Russian, etc. Working with the program is extremely easy. Once you start the software, it will automatically check your Ethernet card driver version, if there is any. If there is a new one available, you can install it directly through 3DP Net within a couple clicks only. Thanks to apps like 3DP Net 14.07 home users can enjoy their Internet connection without any hassles absolutely for free. Please do not hesitate to give it a try right away. We look forward to your feedback. Our security scan shows that 3DP Net is clean from viruses. The current version of 3DP Net has been scanned by our system, which contains 46 different anti-virus algorithms. That ensures that 3DP Net 14.07 is 100% safe for your computer.